Starting my budget meals off with a bang. 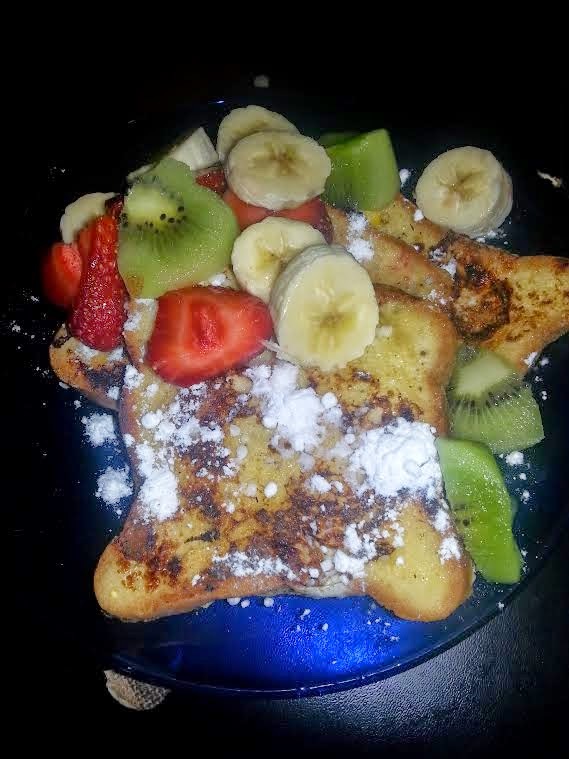 The kiddo had a friend over so I got fancy for breakfast with French Toast and fruit. Worked out to be $1/serving. I realized it's going to be hard to calculate some things because if I've had them in the house won't likely remember how much they cost. Also milk & coffee are luxury items for me so I don't count them against the budget. Milk as a luxury? Yeah, I prefer the taste of raw milk. It's WAY WAY WAY more expensive than regular supermarket milk. It's also something that can be eliminated from the monthly budget if I feel tight that month. With coffee, it's more complicated. I'm not going to eliminate it and I'm not going to drink cheap coffee ever. Maybe it's a necessity, not a luxury. I do save money by roasting my own beans. That makes it about 20 cents a serving most of the time. That's a big savings over 45cents a cup from the kind I buy when I purchase roasted. Funny thing even that is cheaper than those darn K-cups which are not not not good coffee (and bad for the environment). Some people think it's fancy and rave over them, but gag - no. Coffee is an experience for me. From roasting to hand grinding to pour over brewing. I don't take cream or sugar in it very often now. Good coffee will do that. You learn to enjoy the taste and don't want to hide it with other stuff. You can follow my coffee life on one of my other blogs www.krulewich.com I'm posting my year in coffee there. On my instagram I post a cup a day from my collection I love thrift shops and have tons of cups. Too many. I'm displaying them this year and as part of my minimizing my life I will keep a select few and sell the rest. They are almost all vintage cups and as much as I enjoy them - I just don't have the space. I'll post a link when I get around to that. Lunch is leftovers and dinner will be black beans cooked in stock made from the bones of those hams I bought yesterday. I boiled them with some peppers and made 3 quarts of stock. Two will be saved for later and one was used today. Black beans with a bit of ham and some gf cornbread from a mix I have on hand. Today's food will come in at around $3 per person. That's a tiny bit lower than my goal. Good, because some days will be over a bit. It's a rough estimate of course. I'm not sure how to count the ham stock. Mostly those would be trash, but I was able to get some good eating out of them and turn the stock into several more servings. Oh well, as long as I only bring in $300 worth of new groceries for the month.